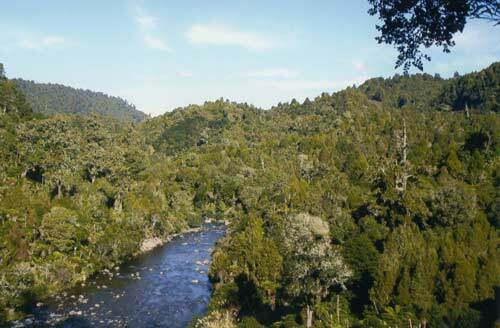 The Whanganui River flows through dense bush. In this rugged country, it is very easy to get lost – as 15-year-old Omega Hemopo found on a walk with her friend. Contributed by Omega Hemopo of Taumarunui. We were staying in a remote cabin in the middle of the forest, beautifully set alongside the Whanganui River. My father and uncle were cutting a track up the river so my friend Toni and I tagged along. ‘Wait for us at the top of this hill’ were my father’s parting words. So we headed off, two 15-year-olds in sandals, shorts and T-shirts. We walked for about 15 minutes up the river through the bush and thought we still had a while to go before we got to the top, so we carried on, following the blue tags nailed to the trees. After another hour we wondered if we had gone too far, especially since we could no longer hear the noisy river. We sat on an old fallen tree and discussed our options. Do we turn around? Or do we keep on following the tags? Toni was not used to being in the bush, so by this time she was yelling all sorts. But since I had taken her into my back yard I had to get us out, somehow. We decided to carry on. The tags must lead to somewhere, hopefully somewhere familiar to me. So off we went for about another hour and a half of scratches, bruises, and of course my companion’s yelling. Tired, sore and hungry, we were still walking when I heard a very faint rustling. It was the river. Nothing had ever sounded so pleasant. We rushed towards it, only to find we were standing on a cliff some 200 metres above it. Being great decision-makers, we ditched the blue tags and headed off through the bushes to the river. After walking for nearly three hours it was wonderful to feel water against our skin. I couldn’t have been happier. I knew where we were, and more importantly I knew where to go. Swim down the river till we get back to our camp, that was the plan. We got bruises on top of bruises coming down the rapids, and swam through deep canyons I wouldn’t dream of swimming in now. Around every corner I was hoping to see something, anything, familiar to me. A couple of hours later I did. I saw a stream entering the river. Our camp was just around the corner. I heard someone yelling my name from the bushes, and my uncle emerged. I was so happy to see him. ‘Have youse been here the whole time?’ he asked. If only he knew. We went back to the cabin and had the most beautiful food I have ever tasted as we told him and my dad about our ordeal. Three years later I can laugh about it and realise how lucky we both were. I have lived with the bush all my life, and this has been my most frightening yet rewarding experience. If only my father knew the importance of the words ‘top’ and ‘hill’. I've been tramping and had a similar experience. We managed to find our way back to the hutt though which was lucky because it was a cold night. New Zealand has some of the most beautiful bush and regional parks. We're really lucky but most people (a) don't get out to enjoy it and (b) don't relise how lucky we are. It's not until we go to a different country the we see the beauty on our back door!